Oh goodness. I’m feeling overwhelmed today, but I did make a second gingerbread biscotti recipe to place in the gingerbread biscotti lineup which will certainly come in handy around 8 months from now when normal people are thinking about gingerbread flavored things. As for me, I liked this better than the previous gingerbread biscotti. It was darker, crunchier (harder, actually – no oil), and had an interesting mix of flavors and textures with the pecans, apricots and orange. Not that the other was one dimensional. It wasn’t. I just liked this one better because it had more depth to it. This recipe is on the Fine Cooking web site where you will also find other reviews. Joe at Culinary in the Country also liked it. He managed to incorporate some whole wheat pastry flour, which was a smart addition. « Regis and Kelly Compost Cookie Success! Anna, these were awesome! I included them in my cookie tins this year, and they are a big hit already. It’s a great way to get the yummy gingerbread flavor in a recipe that’s easier to deal with than rolling and cutting shapes for the regular gingerbread cookies. No chilling time required! Yum! I really love all things gingerbread, so these sound great! I made these one Christmas and they were very popular. I wondered when you posted the last recipe if you had tried this one. I also loved the mix of flavors in this cookie. I made them to send as Christmas presents and ended up making a second batch because I didn’t have enough left to send after all the “quality control” tasting. Love the whole wheat pastry flour addition! I’m always looking for ways to sneak that in. Glad it worked in this recipe. Oh yum. 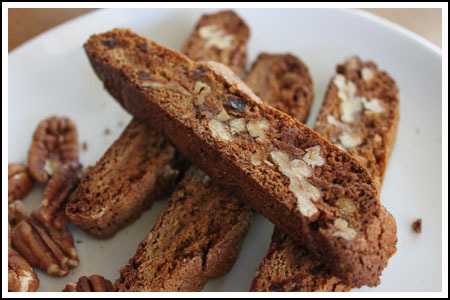 Pecans and dried apricots in a gingerbread biscotti sounds like a good combo!